KoopaTV: In Defence of the 2DS! By LUDWIG VON KOOPA - Cheapening. For your information, I like to write about things that apply to me personally first. I already have a Wii U Deluxe, so a price cut for it isn't helping me. 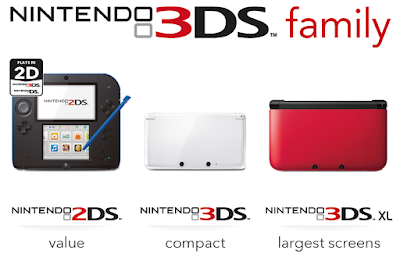 I already have a 3DS, so a 2DS doesn't do anything for me. That said, there is still some industry analysis I can pull from Nintendo's massive — almost-E3-like — day of news yesterday. Easy pickings first. Satoru Iwata very recently said the problem with the Wii U is software, not price. Now (and by "now" I mean "September 20", which means no one is going to buy the Wii U from now until September 20. Poor Hideki Kamiya and The Wonderful 101!) the Wii U Deluxe will be $300 with The Legend of Zelda: The Wind Waker HD bundled, along with other goodies. We here at KoopaTV are happy that people will have a very easy chance to play what we believe to be, by far, the best The Legend of Zelda game. Of course, this is only for a limited time only. The Nintendo Land bundle will exist too but will be $300, while Wii U Basic (which is a terrible deal and only existed to make the Deluxe look valuable) will be phased out. So this means Iwata is wrong the same way that Shigeru Miyamoto lied about there not being a 3DS revision and then a week later the 3DS XL was announced. I still hate that man for that lie. But for the Wii U price cut it's fine since the limited time 30 cent Virtual Console games basically served as an Ambassador Program. Did you miss Punch-Out!! for only 30 cents? Well, Trayvon Tyson's Punch-Out!! is of comparable quality. It's flat. No hinge. Those two screens are really just one screen with plastic overlapping. So it's basically a giant Game Boy Advance. The video claims it's "a handheld gaming system from Nintendo like you've never seen before" but that's not true one bit. Here's a table of the differences. The 2DS isn't even equal to the 3DS XL in power. Also monaural? Ick. If you want real value, it's the price for Phoenix Wright: Ace Attorney - Dual Destinies. The Nintendo 2DS is actually kind of huge. You can't fit it in a pocket or anything. You'll have to buy the pouch for it that Nintendo is selling to keep it safe. Note the target market are kids seven and younger, and they're most likely to take their portable system to school or something, where game systems aren't even allowed. I'm not going to acknowledge those people who go out and say "HEY GUYS I HAVE A 2DS ALREADY I JUST SHUT THE 3D SLIDER OFF LOLOLOL" 'cause they're morons. 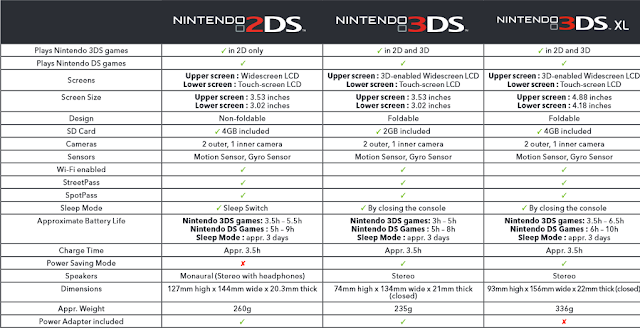 The hinge difference, subsequent size difference, adjusted button layout (which may be better than the 3DS), sleep mode button, and price are all differentiating factors. That sleep mode button is how you do that "close the DS to advance" puzzle in The Legend of Zelda: Phantom Hourglass, by the way. Anyway, the 2DS is actually a good thing for Nintendo and developers. Obviously it's going to move some amount of units (it IS coming out with Pokémon X/Y after all) but more importantly, developers won't have to waste resources creating a 3D effect in games. That's expensive layering effects there. And you have to spend time thinking about how to create not just any 3D effect, but a cool one. It's an added and unnecessary burden to development, and Nintendo probably got enough "never use the 3D effect" in Club Nintendo surveys to make this decision. Good. We could've gotten Pokémon Conquest and Pokémon Black 2/White 2 on the 3DS instead of the DS (and therefore digital download forme) if the 2DS was around. It's really all about the games, and the 2DS allows the initial fixed cost hardware price barrier to be as low as possible. That's how you get games moving off the shelves or the eShop servers or whatever. This helps Nintendo's bank account, it helps developers by reducing the work needed to make a quality game and increases the install base, and it helps consumers by giving them a choice. Stop bashing the 2DS. As long as people don't think the 2DS was some unknown and outdated transition between the DS and 3DS, then Nintendo be fine. But since people don't even know the difference between the Wii and Wii U (ABC News apparently still doesn't), getting consumers to know there is no generation difference between the 2DS and 3DS could be... difficult. People seemed to have trouble with the DS and the DSi just a few years ago! Have fun with that, Nintendo! Follow Ludwig at NNID PrinceOfKoopas on the Wii U. You should be able to buy one now! And buy a 3DS or 2DS or whatever. Ludwig's friend code for that is 3351-5164-3598. Ludwig writes in detail about Shigeru Miyamoto's LIE over here. The 2DS is now getting its own, significantly better hardware revision: The New Nintendo 2DS XL!